The Group is now present in Japan through Hergo Sun Japan KK active in the development and long term investor and operation in Photovoltaic projects. Develop, build, operate and manage fully authorized solar PhotoVoltaic plants, so called Mega Solar Power Plant (MSPP) connected to the local Grid to produce 200,000 MWh/year for a 20 years period in Japan. Low technology risk because the MSPP projects involve systems and technologies that has been tested and applied all over the World and in Italy by ourselves. Team up with well-networked developers to secure land lots. 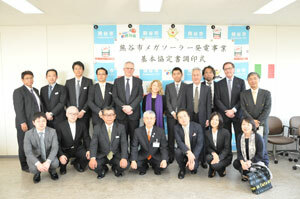 and the help of the strong expertise in the technical and electrical fields by the Japanese staff as well. 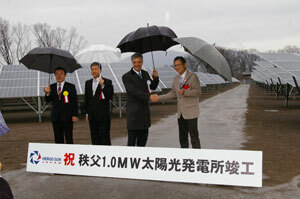 The solar plant of Chichibu owned by Hergo Sun Japan KK, a subsidiary of Infrastrutture Group, will supply electricity to approximately 1.000 households. 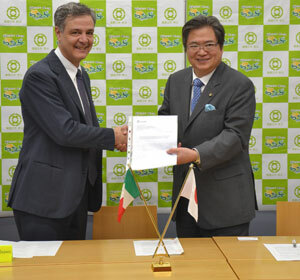 A ceremony in presence of the Mayor of the city of Chichibu, representatives of the Saitama Prefecture, the Italian Trade Commission (ICE) and the Italian Embassy in Japan. Hergo Sun Japan KK, a subsidiary of Infrastrutture Group, has been selected by the Mega Solar Power Committee of Kumagaya City, Saitama Prefecture, Japan for the construction and operation of 3.5 MW solar PhotoVoltaic plant. Hergo Sun Japan KK, a subsidiary of Infrastrutture Group, has been selected by the Mega Solar Power Committee of Chichibu City, Saitama Prefecture, Japan for the construction and operation of 1 MW solar PhotoVoltaic plant.